It is 1967 and four very different women are revelling in the glory of having invented a time travel machine. But in this moment of celebration, in full view of the media, one of the scientists, Barbara, suffers a very public mental breakdown and is removed from the programme. Her former colleague and the leader of the group, Margaret, makes sure that she can never return. The programme cannot be stigmatised in any way. Half a century later, in 2018, Odette discovers the dead body of an elderly woman in a locked room in a toy museum. The reason for the woman’s death is uncertain but Odette becomes obsessed and is determined to discover the truth. She isn’t the only one. Psychologist Ruby is Barbara’s granddaughter and, at last, Barbara is ready to talk about what happened just over fifty years before. But when, in 2017, a message arrives from the near future, Ruby becomes very afraid for her Granny Bee. Something terrible is going to happen. It will be extraordinary. And so begins one of the most incredible novels I’ve read this year – for several years – and it’s all the more remarkable when you think that this wonderful book is Kate Mascarenhas’ debut. It’s an enormous achievement. The Psychology of Time is an immensely rewarding novel that is also very cleverly complex and so you do need to pay close attention. It’s certainly worth it. It is mesmerising. The narrative jumps and skips backwards and forwards throughout, following the lives of a group of women over fifty years or so, but mostly focusing on events in 2017 and 2018, moving to and fro between the years and between the women during different stages of their lives. And making it even more complex and absolutely riveting is that sometimes we meet a character in the ‘wrong time’, when she is time travelling. There is none of that directive that we’re used to that two versions of the same person can’t co-exist in the same time – here you can have as many of yourselves as you like. You can revisit key times in your life and share those times with a limitless number of yourselves. You can even dance with yourself, if you fancy it. I love this element of the novel, and that’s partly because these are the most fantastic characters you could hope to meet and seeing them in different phases of their lives is enthralling. There are so many characters to love here but my favourite is Grace, one of the original four scientists and also an intriguing artist. She has such a delightful nature and the relationship she forms in the novel is captivating and brings with it moments of pure poignancy and tenderness. I’m not going to say more about the characters because you must discover them and fall in love with them for yourself. There are several potential favourites for you to choose from. I also loved how they are all women in various stages of their rich lives, and the fact that the vast majority of the novel’s characters are women isn’t laboured. It feels natural and they’re treated with such affection. Although not all of them are good. The distant future is only glimpsed and it’s worrisome. We hear a little of its draconian laws, and learn that its reintroduction of a kind of medieval trial by combat – except here it’s trial by fate – is brought back into the present day for time travellers who do wrong. The science behind time travel is just touched upon but the main focus of the novel is on how it affects those who do it, as well as their families and those who love them. And here we spend time with people seeking to understand it, especially Ruby and Odette. The mystery at the heart of The Psychology of Time Travel is such a good one and every bit as quirky and curious as the rest of the novel. But its enormous appeal lies mostly in these wonderful, wonderful people and the wit and warmth with which they’re described as they flit and dance through each other’s lives – and their own. Sometimes they can bring misfortune, even death, but mostly they bring love and such a depth of feeling. There is so much to love about this glorious, beautifully crafted novel which treats time travel in such an original and enthralling way. It’s not possible to do The Psychology of Time justice, at least for me, and so I urge you to treat yourself and discover its wonders for yourself. This entry was posted in Review, Sci Fi, Thriller, Time shift and tagged Science Fiction, Thriller, Time shift on August 14, 2018 by Kate (For Winter Nights). Emmett Leigh is a used book dealer and one day in London he finds something that catches his imagination – a love letter from one soldier to another, written during the Second World War, hidden away in a book of poetry. Emmett is determined to find out everything he can about Tom and Ben and it takes him on a trail of bookshops and collections in England and further afield. What he finds seems impossible – photos taken during other wars and times, including World War I, and Ben and Tom look no different. Emmett has to accept that these two men are time travellers, lost in time, searching for one another, using the letters in copies of this book of poetry as a map. Time Was is a novella and, as a result, skims the surface of a story that has the most intriguing premise – lovers cast out into time by a wartime scientific experiment that went very wrong indeed. On one level, it’s a gay love story that is both touching and tragic, and on another it’s a science fiction tale of time travel and wartime experiments. Both are equally appealing but I’m not sure that the story completely makes up its mind over which way to go. It is, though, exquisitely written. Ian McDonald writes so beautifully, filling this little book with poetic prose. I loved the setting for much of the story which is in Shingle Street, Suffolk. I love books set in places that I’m fond of and I adore this area. The author captures it perfectly and it presents such an evocative backdrop to Ben and Tom’s story. Mostly, though, this is the story of Emmett, a man who has problems in his own relationships. I thoroughly enjoyed the way that the story ends. I can’t say that I understood it completely but I loved how the strands came together. I am a huge fan of Ian McDonald’s Luna science fiction series. I will always seek out his writing. Time Was wasn’t quite what I was expecting but it certainly resonates and it most definitely haunts. This entry was posted in Earlier 20th C, Historical Fiction, Review, Sci Fi, Time shift and tagged Historical fiction, Romance, Science Fiction, Time shift, World War Two on May 21, 2018 by Kate (For Winter Nights). It is 1997 and a terrible crime has destroyed a family in the small town of Canonsburg in Washington State. A mother and her young son and daughter have been slaughtered in their home – the father, a Navy SEAL, is missing, and the detectives must presume the worst, but so too is the teenage daughter Marian. This is all far too close to home for Shannon Moss of the Naval Criminal Investigative Service who is assigned to the case. She knows this very house. It had been the home of her childhood best friend Courtney and Courtney too died a violent death, many years before. Moss is determined to find Marian alive, to stop history repeating itself. Nobody knows more about that than Moss. She is a time traveller. Her job is to journey into the future for clues to crimes in the past. But there is more to it than that – she has seen the Terminus, the end of humanity, and each time she travels into the future she learns that the date of the arrival of the Terminus is drawing closer and closer and closer. When Moss discovers that the missing Navy SEAL was one of the crew members of the space ship USS Libra, she knows that this is a case of monumental significance. The Libra went missing far from Earth in time and space, lost in Dark Time. The clues must lie in the future but, Moss fears, she may also find them in her past. The Gone World is one of those wonderful things – a mindboggling and jawdropping time-travelling thriller that wraps up the reader – and its poor main protagonists – in knots of paradoxes, conundrums and spacetime continuums. I go into a book like this not expecting to understand it all but, as long as it makes me believe in it, then I’m happy and this novel certainly did that. It has a fantastic premise – and the apocalyptic appeal of the Terminus wasn’t lost on me – and it has several theories about the side-effects of time travel that are really fascinating. I particularly liked the idea that the futures visited by Moss and her colleagues would puff out of existence the moment that Moss left them. Her presence in that particular future would mean it would be rewritten and so could no longer exist. And some of the people in those futures know that. This adds a tension that works brilliantly. Who can Moss trust in the future? Can someone she was close to twenty years before still be relied upon? I love the questions that a good time travel novel pose and this novel is full of them. Tom Sweterlitsch writes so beautifully. His vision of the end of the world is starkly, terrifyingly wondrous. The descriptions of the time travel itself, which involves a trip into space, are engrossing and stir up big themes about life on this planet, Earth. The structure is also very effective as we move back and forth in time, between first and third person perspectives. But down to Earth, The Gone World is also a novel about families, relationships and that elusive goal of happiness. Shannon Moss is inevitably altered, physically and emotionally, by her journeys into her future and that makes her relationship with her mother particularly difficult. But it also alters her relationships with her colleagues. All of this is never far from Shannon’s mind, as is her past and her memories of Courtney. And the secrets don’t help. The past, present and future are all tangled up in this intriguing world. The big themes are matched by the engrossing plot, which, in a novel as pleasingly complex as this one, could never be straightforward. There are shocking moments alongside the moments of tenderness and there are those wonderful instances when we come across the direct consequences of something that has happened in the past or future. I can’t pretend to have understood everything that is going on in The Gone World and there were occasions when I became a little lost during the final third of the book. But, nevertheless, I thoroughly enjoyed the novel, just as I did its (unconnected although also a crime novel with a time travel twist) predecessor Tomorrow and Tomorrow. Clever time travel thrillers are to be savoured and The Gone World is especially thought-provoking, rewarding and mindbending. This entry was posted in Crime, Review, Sci Fi, Time shift and tagged Crime, Science Fiction, Time shift on March 31, 2018 by Kate (For Winter Nights). Melisande Stokes is a lecturer in ancient and classical languages at Harvard University when she is offered a curious job by government secret agency operative Tristan Lyons. It’s likely that Mel would have taken the job anyway thanks to her patronising, arrogant and irritating boss, but it turns out to be simply perfect. Mel is given a number of ancient and more recent documents to translate as part of a test. The texts come from all six continents and from every era and they all attest to one thing – that magic is real. Or rather magic used to be real. The documents also reveal that magic died in the summer of 1851, killed by the Great Exhibition of London. Mel’s job, should she choose to accept it, is to join a top secret government project, D.O.D.O., otherwise known as the Department of Diachronic Operations. It has one mission – to develop a device that will allow its operatives to travel back in time to save magic and alter history. After all, what government wouldn’t want to have magic at its beck and call? Unfortunately, meddling with the past can have a rather adverse and unpredictable effect on the present, especially when so much depends on MUONs – Multiple-Universe Operations Navigators, better known to you and me as witches. The Rise and Fall of D.O.D.O. is quite simply spectacular. It’s almost impossible to describe or to pin down. There’s a distinct science fiction feel to bits of it – it is, after all, a novel about time travel and the descriptions of how it works are both sciencey and deliciously unfathomable. That is indeed the point. This classified government agency likes to blind us by science at the same time as confounding us with acronyms. But the science is powered by magic which is also powered by science. There is a rational scientific explanation for everything. I think. Or maybe there isn’t. I’m not sure the witches care very much. I’m not a reader of fantasy or anything to do with magic normally but this novel absolutely enchanted me, in the same way that The Long Earth series by Terry Pratchett and Stephen Baxter has done. It presents an incredible and seductive mingling of science and fantasy, of alternate universes, broken futures, impossible conundrums and, my favourite, the temporal paradox. All of this on top of some brilliantly visualised journeys into the past, especially late Elizabethan London and 13th-century Constantinople. These are places teeming with the most fascinating and intriguing personalities, notably the witches but there are also lots of others, and it’s particularly fun watching them deal with an unfamiliar future or past. The missions into the past are fantastically complicated! This is not surprising considering the tangled knot of D.O.D.O. bureaucracy and it all adds up to a wonderfully elaborate and varied bunch of plots as different people pursue their different goals and get into all kinds of trouble. This adds drama and, now and again, tragedy but it also adds a great deal of humour. The humour of The Rise and Fall of D.O.D.O. is lightly done, often the result of the absolute absurdity of a situation or the preposterousness of trying to impose officialdom on potential chaos. There is also a lesson to be learned – don’t underestimate people from the past. They might not know how to operate a mobile phone but they – and I include Vikings in this – are not stupid. The Rise and Fall of D.O.D.O. is over 740 pages long but not once did this feel like too much. On the contrary, it quite often felt like too little! There is so much going on. There is so much potential for more to go on. I loved the characters, especially Erszebet. And it is all written absolutely beautifully and in the most intriguing manner. It’s told in a multitude of ways – journal entries, letters, emails, government documents, memos – and they work together brilliantly. At the end is a very handy glossary of acronyms (as defined by POOJAC – the Policy on Official Jargon and Acronym Coinage). As for the premise of this fabulous, clever, witty book, it is ingenious and only equalled by its execution. Neal Stephenson’s previous novel Seveneves was one of my top reads of 2015. The Rise and Fall of D.O.D.O. (or TRAFODODO) will do at least as well in my 2017 list. Do not miss it! This entry was posted in Fantasy, Review, Sci Fi, Time shift and tagged Fantasy, Science Fiction, Time shift on June 5, 2017 by Kate (For Winter Nights). Kate Vasavour, badly injured from a great fall, has been in a coma for several days. When she finally awakes in her hospital bed, Kate has no idea who she is. She can’t even remember her own young son. She has tantalising shadowy memories of people and voices but when she reaches out for them they disappear. Her doctors comfort her, Kate is traumatised, her memories will return. But when the memories do start to emerge in a more tangible form, Kate realises that they don’t belong to her. She is remembering the life of another person, a woman desperate to find her child. Kate feels driven to help her search, Kate’s pain made worse by her growing awareness that she has forgotten her feelings for her own child. At the beginning of House of Shadows, we are as ignorant as Kate is of her life and background. But when Kate’s rather formidable in-laws take her back to her late husband’s home – the impressive, Tudor-built Askerby Hall – the nature of Kate’s memories begin to emerge. Kate is remembering a previous occupant, Isabel Vasavour, who lived and died at the Hall over four hundred years before. Something terrible happened to Isabel and it is up to Kate to put it right, even if it puts her relationship with her son in jeopardy and risks her sanity and her very life. Some years ago I had a great fondness for timeslip novels, such as those by Barbara Erskine, and, although it’s been a while since I read one, there was something about the mood of House of Shadows that instantly pulled me in and reminded me of the pleasure I had reading such novels as Erskine’s Lady of Hay all those years ago. Pamela Hartshorne does a wonderful job of evoking the past and present of Askerby Hall, a suitably creepy and yet beautiful old house that creaks with history, not all of it bad by any means, and is scented with atmosphere. We move between the Elizabethan and modern periods smoothly, almost naturally, and both feel as real to us as they do to Kate. That is until Kate grows closer to the truth and then the novel takes on a different feel entirely – we then dip into melodrama and horror – but the book retains its almost gentle atmospheric appeal throughout. Kate is a very sympathetic character surrounded by a host of oddballs. Even though she cannot remember her own son, Kate and the boy do work to recover a relationship almost as if they feel united in their isolation within this enormous house. I really enjoyed this element of the novel. It’s also hard not to care for Isabel of the past, especially as we know it cannot end well. The mood of mystery hangs over House of Shadows and works well with the movement between past and present. There is much that is predictable about the mystery and plot of House of Shadows but that almost doesn’t matter. This feels like a comfortable, old-fashioned read. This also helps to justify some of the more stereotypical characters as well as the familiar house itself. House of Shadows certainly fit my mood when I read it. Despite work and everything else going on that day, I read House of Shadows in just one day. It was a truly delightful and compelling read that enchanted me from its very beginning and I could not put it down unfinished. This entry was posted in Historical Fiction, Horror, Review, Time shift and tagged Historical fiction, Horror, Time shift, Tudor on December 2, 2015 by Kate (For Winter Nights). This is a little bit of a review with a difference. The Infinity Cage is the ninth and final book in the extraordinary TimeRiders series. Ostensibly aimed at youngsters, I don’t think Alex Scarrow could have targeted TimeRiders more directly at me if he’d tried. Over the last few years I have jumped on each of these books as they’ve been released and now, knowing that the series is done, it’s hard on the heart indeed. The good news, though, for others if not for me, is that now you can read books 1 to 9 in one fell swoop, no agonising tearing out of one’s hair during those irritating long months of drought. It’s all out there waiting for you and what a treat you have in store. It hardly needs saying but you would be certifiable to read The Infinity Cage without having read the preceding eight books. Were you to do such a thing you would drown in a foggy bog of unknowingness. It also makes it a very difficult book to review. I don’t want to give anything away about what is to come nor do I want to spoil what’s gone before. But what I do want to say is that The Infinity Cage finishes the series perfectly and satisfyingly. Alex Scarrow mapped out the entire length of the series from the very beginning and it shows. Not only is the series well-structured but it also has all of its loose ends and time travel strings of conundrums, of which there were many, tied off neatly. That is no mean feat. Also, by now we are all attached to the TimeRiders themselves – finishing their story to the satisfaction of their fans cannot be easy, but Alex Scarrow knows exactly what to do. He also has the confidence to have the fates take their course with key characters – some of the main figures do die in TimeRiders. The Infinity Cage might be satisfying, exhilarating and thrilling but it is also tragic and harrowing. 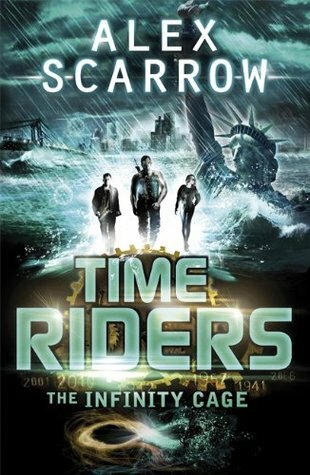 TimeRiders is written for youngsters but Alex Scarrow knows exactly how to address them and, as a result, this is a series for all ages. So, because I can’t go into The Infinity Cage with any kind of detail because you need to wait till you reach it and then you can marvel over its perfectness yourself, here are a few reasons why you should read the entire TimeRiders series. Our TimeRiders – Liam, Maddy and Sal, three teens ripped out of their own time (for instance, Liam who was serving aboard the Titanic) and given the biggest of all responsibilities. Taken out of time themselves by some sort of future mysterious agency and placed into a ‘bubble’ on the eve of 9/11 in New York City, they must identify and fix changes in time. These three teens are impossible not to care for. I have grown to love them all dearly and I doubt I’ll ever forget them. Helping them, of course, are Becks and Bob, seven foot support units with an artificial intelligence and an increasing ability to care – and joke (not hugely successfully). Later in the series, our three have other helpers who alter the lives of Liam, Maddy and Sal, including another especially irritatingly cheerful robot. Over the years we come to love even him. Maybe. The mystery – nothing messes with time more than timeslip novels and in TimeRiders we see the full effects of that. From time ripples to full out tidal waves, Liam, Maddy and Sal have to sort it out, even if that means a jungle world ruled by intelligent lizards. The mystery comes from the future, too. What is the agency? Who is Waldstein? Who is Fowler? And why, if the agency wants them to save the future, do they keep sending forces back to kill them? And what are those beings who inhabit Chaos Space, the places in between the past, future and now? Twists and turns – they’re here in abundance. Darkness and fear – Alex Scarrow pulls no punches. There is violence, death and grief in these pages. Not surprisingly really when you consider that it’s the fate of all humanity that’s at risk. People age before their time while others are lost in the gaps. Time travel itself is a dangerous business. Those who don’t check their destination first might end their days melded to a horse or another person or turned inside out. Disgusting, but you can’t look away. But if you want to find true horror, just beware the glimpses of the future. History – a love of history shines through these novels. The destinations we travel to are brought to life whether the world of the dinosaurs, the court of King John, the American Civil War, ancient Rome, the Great Fire of London, Victorian London, the Mayan empire or Jerusalem at the time of Christ. And all are linked to our time through clever clues from the past, some of which cannot be deciphered for two or three books into the future, maybe more. Adventure – whatever the horrors, however heavy the responsibility weighs on the shoulders of our young heroes, nothing’s going to get in the way of a fine adventure. And because of the vagaries of time, this means that characters can spend years as sheriff of Nottingham back in the 11th century or years as a pirate king on the 17th-century high seas. Everything about 2001 New York is wondrous to Liam, the Titanic cabin boy, although that’s nothing compared to going back to the Jurassic or battling Caligula’s armies. Timeless – I can’t think of another series of books that I’ve enjoyed as much as TimeRiders. I’ve written about them for years. My one consolation in knowing that there will be no more is in going back and re-reading the full set from the beginning. The series will most definitely stand up to a re-reading – it is full of clues, intentionally left for readers to rediscover. TimeRiders entertains but the series also makes readers of all ages think – about the past and future – and marvel and puzzle and love. I adore Liam, Maddy, Sal, Bob and Becks. I reckon I always will. This entry was posted in Review, Sci Fi, Time shift, Young Adult and tagged Science Fiction, Time shift, YA on November 15, 2014 by Kate (For Winter Nights).